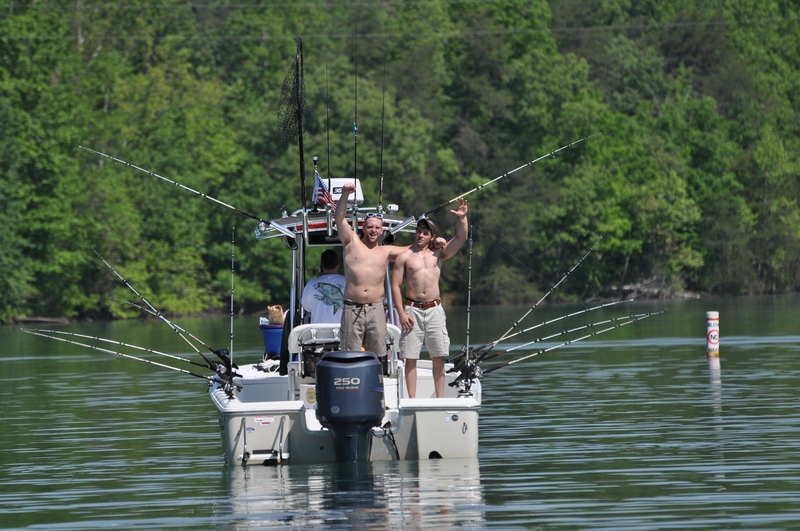 For three years in a row, Freedom Alliance has celebrated Military Appreciation Month and Armed Forces Day weekend by inviting combat veterans and their families to attend our annual Smith Mountain Lake event. The Westlake Waterfront Inn on a secluded section of the lake’s shoreline is our venue for two days of fishing, eating, and relaxing. 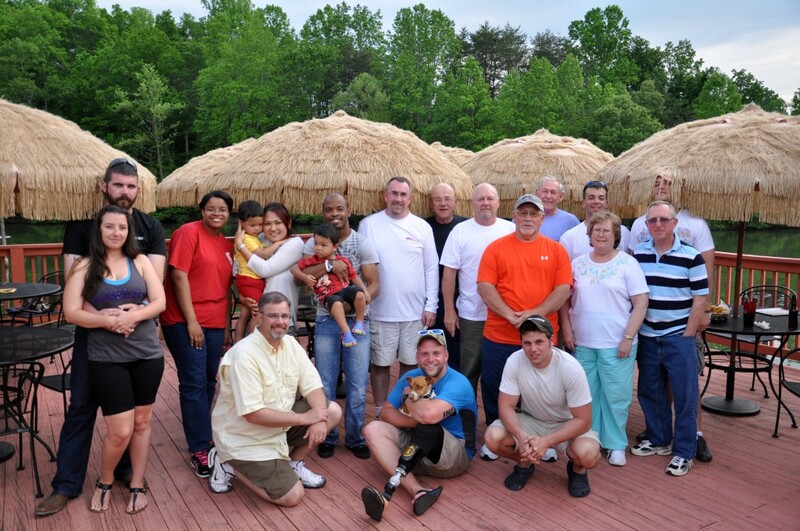 This year, we hosted 14 service members, from Baltimore, Maryland, Greenville, North Carolina, and points in between. Will, an Army combat medic with the 10th Mountain Division, was the first to arrive with his Jack Russell Terrier, Digz. Will is a patient at Walter Reed National Military Medical Center since suffering injuries to his lower body, which resulted in a leg amputation, caused by an explosion while deployed in Afghanistan. John, retired from the Army, served with Will at Fort Wainwright, and he came up from North Carolina as well to join us. Rob and Heather traveled down from Walter Reed, where Rob is receiving treatment for cancer. He is a keen angler and marksman, who had recently participated in a successful shotgun shoot for Freedom Alliance. Marine Sergeant Ronnie made the escape in between dialysis appointments, arriving with his wife and two toddlers. Ronnie is in end-stage renal failure and awaiting a kidney transplant after his deployment to Okinawa, Japan. His family came with Ronnie’s twin sister, Connie, who is a Navy Corpsman stationed at the neo-natal unit at Walter Reed. The first evening began peacefully with some lakeside barbeque and peach cobbler. The Smith Mountain Striper Club brought their boats by the hotel and took us aboard for a sunset cruise before a thunderstorm. While on the porch that night, sharing tall tales and laughs, our last guest, Marine Sergeant Jeremy, showed up with his girlfriend Amanda. Also a patient at Walter Reed, Jeremy suffers from a traumatic brain injury and damage to his back after five deployments to Iraq. 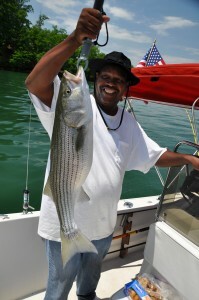 At the crack of dawn the next day, the Smith Mountain Striper Club roused the troops to the boats. Clad in special Freedom Alliance fishing shirts, courtesy the Striper Club, the gang toted their breakfasts on board and hoped that the fish would also be looking for a bite. Ronnie and Connie embarked with Captain Lee and Mark, a retired soldier and crafter of custom fishing rods. Connie pulled in a 22-inch striped bass and Ronnie caught a very plump catfish, which, in accordance with tradition, he subsequently kissed and released. Navy veteran Kevin and Korean War vet Winston joined us for the day of fishing, too. 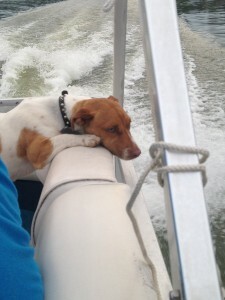 Winston boarded with fisherman Mackie, and Kevin fished with Chuck, an Air Force veteran, and his first mate, Bill. Kevin pulled in two stripers and was quite pleased until his boat met with Winston’s and he discovered that his friend had reeled in nine! That afternoon, however, Kevin caught three more, and both men took home two each to fry. At noontime, the boats pulled in to Mitchell’s Point Marina for lunch. The restaurant manager Jeff is a former V-22 pilot, and he donated pizza and drinks for all the Freedom Alliance boaters. That evening, after the fishermen docked, we all walked to Los Machados for Mexican food on the patio overlooking the lake. After relaying the reports of the day, the prize for biggest fish went to Will, who brought in a 25-inch catch. With ten fish in the boat, Rob and Heather boasted the highest yield. With varying success, there was still one thing the service members shared—it was a positive sentiment. All our guests had a blast and they let us know.